ISLAMABAD: Chief Justice of Pakistan (CJP) Mian Saqib Nisar on Thursday said that despite leading the institution, he has been unable to put his house in order. The CJP made the remarks while hearing a petition filed by five lawyers seeking judicial reforms. “I openly admit that I have been unable to put the house in order,” said the CJP during the hearing. Commenting over his visit to the Larkana district courts, Chief Justice Nisar clarified that he had admonished Additional District and Session Judge Gul Zameer Solangi because he had decided only two bail applications till then and orders were yet to be dictated in the cases. On June 23, Justice Nisar tossed the mobile phone of the judge after admonishing him for using the device during court hours. 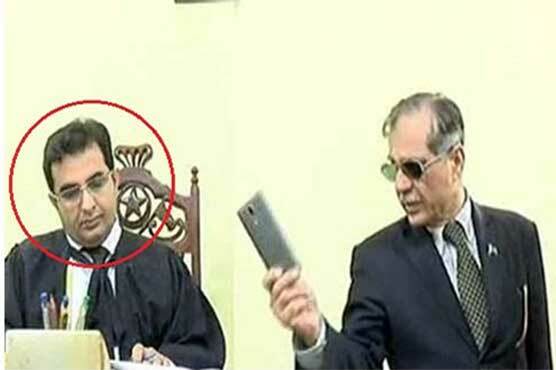 While visiting city court-III, Justice Nisar grabbed the session judge’s cellphone and flung it on his table. He then asked the judge about the cases he had heard since the morning. The judge said he had heard three cases since morning. To this, the CJP shot back: “How can we ensure provision of justice when judicial process is so slow? “Where are Sindh and Pakistan going? … What are you doing for the cases of missing persons? … Wrap up these cases swiftly,” he said. A day after the CJP’s rebuke, Judge Solangi said that he was resigning “due to the humiliating behaviour of the top judge” during proceedings in his court “which were widely aired in the electronic, print and social media”. Solangi, who had been serving on the post since March last year, added that he was unable to continue serving as a judge after suffering “deep anguish and injury” to his “self-respect and dignity”. He requested immediate acceptance of his resignation. While hearing the petition, the four-member bench, headed by the CJP, also asked the Balochistan High Court (BHC) and other respondents in the petition to submit their replies. Petitioner Umer Gilani stated there is a need to amend the rules to curb delays in dispensing justice. Justice Nisar said that high courts could amend their rules. He hinted towards the formation of a larger bench that could be constituted to hear the matter in future. However, the CJP further asked the petitioner to visit his chambers to discuss the matter. In January, CJP launched an initiative for judicial reforms. He started his mission by visiting the Quaid’s mausoleum in Karachi where he offered Fateha and prayed for the country’s success, peace and tranquillity. He pledged to take judicial reforms to fruition expeditiously so that the general public begins to reap the benefits of this initiative as soon as possible. The CJP also chaired all Pakistan Chief Justices Conference to launch judicial reforms.